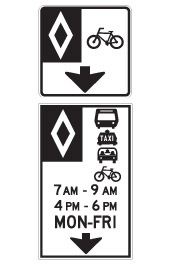 Does this mean "Only a car with 3 or more people, bus, taxi, bike, and motorbike can use this lane at the specific time listed below? What about the time that's not listed? For example, can I use this lane alone in the car during Sunday? Yes. You can use this Lane any other time stipulated without meeting those conditions. Yes, and yes, outside the referenced timeframe you can use it whatever. How did you pass your G1? All I notice is that other vehicles are fearful of using that lane during those non-hours lol. signs or no signs. People don't give a crap of them, they drive however they pleased. That is true. Just like the 404 HOV lane. Does the police even have those sting operations anymore?